- would you adapt your style of playing? I am thinking chord-melody might 'clash' with guitar accompaniment and you would play more single-note melody style? Have you heard this! https://www.youtube.com/watch?v=RQ-TJUFFQQU It's definitely not beginner but it's an amazing use of those instruments! Another great group to check out are the 6, 7/8ths String band and I'm sure you're already familiar with Clifford Hayes' groups and The Dixieland Jug Band Blowers recordings. Those are both good models to show that you can play any tune with a string-band instrumentation but the jug band tunes and rags are nice because they usually give every one a feature moment with different people playing melodies to different strains or sections. Having said that a tune I play in jug band/string band is 'Shine on Harvest Moon' that's a really simple and wonderful tune! With anything from the other list the ony thing you might want to adapt for those instruments are the keys. G is a very fiddle friendly key and some of the flat keys which are friendly for horn players are not ideal for string instruments. I think it's a good idea to adapt the way you play within any group setting. You're absolutely right in the fact that playing single-note melodies, if you're playing the melody, is a better approach than chord-melody in a group setting. Chord-melody is a lovely approach to tunes if you're playing solo or perhaps even a duo setting. Elmer Snowden is in my opinion the best at playing single-note melodies on the banjo. His record 'Harlem Banjo' is a gold-standard. Depending on the skill level of the players you're playing with, violin or harmonica would be the go-to 'melody' instruments and then you and the guitarist can find a way to accompanying well together which is an exciting experiment in it's own right. But with good arranging you could play intros or breakdowns as a chord-melody that could be a lovely device. Good luck with it all and hope you can find more motivation in playing it is certainly a joy when it can be a communal process! 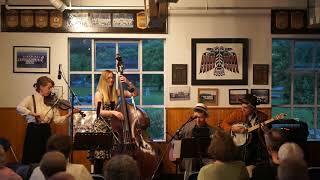 Here's a band I play in that has it banjo, fiddle, bass and guitar. Thanks for your reply, Jack. I hadn't heard of the 6 7/8th string band before - love it! I am also a big fan of the Elmer Snowden 'Harlem Banjo' album. Listening to those early string bands it seems that the tenor banjo could replicate the role of the mandolin/banjolin with single-note playing lead and chord back-up accompaniment. I do have an old tango banjo kicking around but it needs set-up (that would mean learning mandolin tuning and probably the dog wearing ear-defenders while I practice). Anyway, lots to explore. Hey, Jack - thanks for posting the videos of your band - that's right up my street. Some great single-string playing. Also, love that tune 'Frog-I-More' - it is a good example of playing with acoustic instruments with banjo backup and then cool lead break at 2.50. Shows what you can do. Thanks. learn how to play some different styles. There are a few people around who play tenor banjos with a cross picking style that can duplicate pretty close the sound of a 5 string. this is basic cross picking but gives th eidea...there is also a band thta has a cross picker....if I can google or remeber their name I'll post it for you. Good topic. I've attached the video that got me interested in the tenor banjo. No horns. Just some great song writing and sparse use of instruments. My motivation ebbs and flows also (I still have to work for a living and can't spend as much time as I'd like). Like you i'm very much a beginner, just trying to find my own voice with this instrument. Personally I'm not limiting myself to any one style of music. My technical abilities (inabilities) are currently defining my style but I can hear things in my head I just can't do it yet. But that is what made Tony Rice a great guitar player, he wanted to sound like Clarence White but was unable to. Now everyone wants to sound like Tony. I would imagine there are some horn players around your area, and probably like you would love to have someone to play with. Anyway to get the word out? I've also had fun playing with accordion players. Thanks for the suggestions to explore different styles. I like that video of Tom Wait's, Mike - love the spooky bluesy twang of the banjo. You can do a lot with less. l like listening to CW Stoneking (who uses a smattering of banjo) and Curtis Eller (5string) who are both great live performers. I suppose I'm questioning why the tenor? I am interested in hearing where you take the tenor, Mike and hope you keep posting. I think accordion and banjo go really well together - the band Rattletrap Ruckus have a great tenor banjo player called Casey Connor. 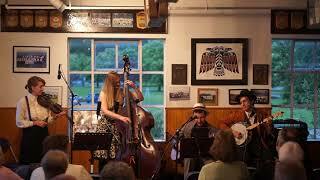 Here's some Bluegrass I played on tenor a couple years ago Carrie. The instrument hasn't been explored at all yet in other styles.jmo. You can play anything on it, and in anyway. It's whether people will except it or not? that's the question. I don’t know your location, but you might find some pubs that have sessions that are for acoustic music only. I would steer clear of those with the loud rock bands. I think some of the pubs have sessions for beginners, which could be beneficial and fun. Sounds great David. You know you're right about the tenor banjo - there is much to be explored. I've made a list of tunes to get under my fingers - my fiddle playing friend plays Sweet Georgia Brown and Beaumont Rag in F and also Tico Tico in Am. I also play Dallas Rag and there are other stringband tunes I could learn. And then there's ragtime - and calypso - and jazz, of course...….. Your going to have fun I'm sure! If you can't find people to jam with, you might like to consider investing in a 4-track digital recorder. Or, totally for free, installing Audacity on your PC. But you'll probably need an audio interface to make that work. I don't know if you play more than one instrument. But if you do, turning yourself into a band and/or a choir is great fun! I wouldn't bother trying that melody banjo if you'll be playing with a mandolin. Same tuning, so you might drown the poor plyer out. I'm with Jack Ray when he says "it's a good idea to adapt the way you play within any group setting." I just now watched your videos, Mr. Ray, and I enjoyed the heck out of them. Thank you for posting them. They are a day brightener, for sure!